Aletha Mae Dickerson-Robinson’s role in the Paramount 12000-13000 "Race" series has long been underestimated, not least by herself. Aletha worked for Paramount for almost a decade, mainly with her husband, Alexander Robinson (1894-1970), who was employed as pianist, arranger and songwriter. Born in Chicago on April 24, 1902, she was the only child of Walter Dickerson and Garvinia Esters. She was brought up in a musical household - according to the 1910 Federal Census, when the family were living at 2248 Dearborn Street in Chicago’s South Side, her father was working as a "Musician in Caf`E9," while her mother worked as a "Music Teacher." With this background, and her thorough grounding in music theory and practice from both parents, it is not surprising that she chose a career in the music profession, and her involvement in Paramount’s historic recording enterprise began at a relatively young age. Aletha worked for Williams’ publishing company, the Chicago Music Publishing Company, in effect Paramount’s music publishing business, where, among other duties, she typed out the song lyrics and deposited the songs, together with the music, at the Library of Congress in order to register them for copyright. She did so until 1928, when Williams left to join the Vocalion company. Contemporary with her tenure as Williams’ secretary, Aletha and Alex Robinson also ran Dickerson’s Record Shop at 31st and State Street, a popular hangout for black and white Chicago musicians. She and Robinson may have also worked behind Williams’ back - she gets composer credit on Jimmie Blythe’s Fat Meat and Greens and Jimmie Blues (Paramount 12304), with another recording of the first title by Jelly Roll Morton for Vocalion in 1926. According to the Library of Congress files she co-wrote it with one John Bishaw (shown as ‘Bishow’ on the label and copyright was deposited by Aletha Dickerson on June 27, 1925 with no specific publisher shown. 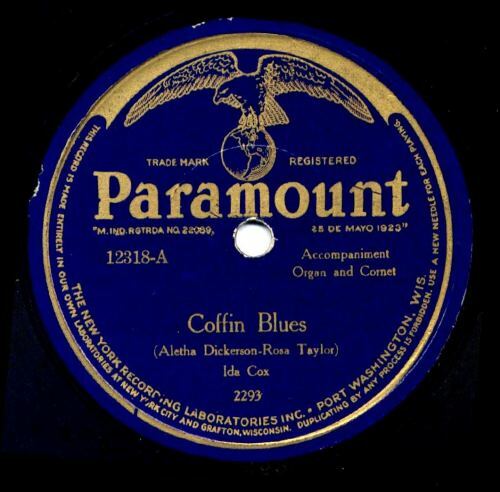 Both she and Jimmie Blythe share the composer credits for Jimmie Blues, whilst she and husband Alexander Robinson share composer credits on Atlanta Black Bottom, the only recording of which was made by Fess Williams and His Royal Flush Orchestra for Vocalion in New York in November 1926. Again, on the latter title, no specific publisher is named in the Library of Congress files. With Mayo Williams’ departure for Vocalion, and without ever being officially informed, Aletha had, by late 1928, become Paramount’s recording director. According to Thomas A. Dorsey in a letter to Max Vreede (February 26, 1961) "Alexander Robinson and his wife Aletha ran the race record department and managed the Hokum Boys." The Chicago Defender of June 22, 1929 ran the following item: "Lethia [sic] Dickerson, prominent businesswoman and musician, has charge of Paramount studios and fills the bill well." Three months later, the Defender reported that "Alethia [sic] Dickerson, the Paramount recording manager, is busy securing new talent for recordings to be made this month for Paramount. Several new artists have been added to Paramount’s list." As confirmation of her role, unofficial or otherwise, within Paramount’s recording department, the 1930 Federal Census lists her as "Manager of Music Co."
She continued to work for Paramount even after the company relocated its recording studios to Grafton, Wisconsin. Skip James remembered seeing an attractive black woman in Paramount’s studio during his late January, 1931 session—almost certainly this was Dickerson. Among the new artists she brought to Paramount were singer Laura Rucker, and brother and sister act Arnold and Irene Wiley. Irene Wiley’s diary notes that they went up to Grafton in March 1930 (not c. December 1929 as stated in Blues and Gospel Records), taking with them legendary guitar evangelist Blind Joe Taggart and his guide and accompanist, Josh White. What follows is mainly her own story from letters addressed to music publisher and promoter Harrison Smith and the late John R. T. Davies, which were found in the remaining archives of the late Max Vreede, author of the landmark study of Paramount’s Race Records "Paramount 12/13000 Series." With the help of Max’s widow, Elli Vreede and his brother in law Ralph van Vurth, the letters emerged from the dust. The letters were written by Aletha between April and November, 1972, two years after the death of her husband, Alex. At the time, she was living in New York, having moved there from Chicago in the 1950s, and where she continued to live until her death on March 30, 1994, just short of her 92nd birthday. "The first time I handled a recording session, I brought in the Hokum Boys. Among other artists I supervised were Ma Rainey, Ida Cox, Blind Lemon Jefferson, Will Ezell, Pace Jubilee Singers, Blind Blake, Meade Lux Lewis, Charley Spands [sic], Freddie Brown, Alex Hill’s band, Laura Rucker and others whose names I can’t recall. All these sessions were for Paramount." "Alexander Robinson was known by his full first name - also as Alex Robinson - and, on a few recordings, as Bob Robinson. He played piano well - very well, but never made a [solo] piano recording. He was known as a songwriter, singer and teacher. Alex was a baritone. He and Jimmy Blythe had a program for quite awhile on radio station KYW before the station moved to Philadelphia. They were written up in the daily papers. My husband made a recording of two pop numbers for Paramount, Moanin’ Low and Lonesome Road and a test for Paramount which is where Thomas Dorsey heard him sing and asked to form the trio with him. (2) This was the first Hokum Boys session for Paramount, and the first session I managed for Paramount. This session was in Chicago, many others were in the Gennett studios in Richmond, Indiana." "That session, I discovered I was in charge. Nobody asked me. They just put me in charge. The trio consisted of Dorsey, Tampa Red and Alex. Dorsey was formerly pianist for Ma Rainey and, with Tampa Red, made Tight Like That for Vocalion, but weren’t [sic] under any contract. Alex was the lead singer. Dorsey sang with him on choruses, composed the songs and had suggested the trio’s name: Hokum Boys, ‘cause this is pure hokum. The session he made for me was one record: Selling That Stuff. (3) It was a tremendous sale. Vocalion (Jack Kapp and Mayo Williams who had left Paramount for Vocalion), persuaded Tampa Red to sign with them." "Next records by the Hokum Boys were by Alex, Dorsey and Josh White. (4) After several recordings, Dorsey became known as Thomas Dorsey, publisher of gospel music; he left Paramount and wouldn’t do any further recordings of non-religious music. (5) Alex Hill came to town and made quite a few recordings with my husband and Josh White. For awhile, Alex Hill had free space in my office at 208 South Wabash. Alex Hill did write some of the tunes after Dorsey left. Some of the others were written by Alex (my husband), some by me and some by other composers. Josh White left to return to his home in the South and on one recording session, Alex Hill brought in Ike Robinson to complete the trio. Ike Robinson made only one record with the Hokum Boys." "Alex Hill left for New York. Alex, my husband, used on one session, Jimmy Blythe, and then John Erby on piano. (Note: a session by the Hokum Boys in New York May 1, 1930, lists Alex Hill and Ikey Robinson recording two titles.)" "Funny thing: neither Alex Robinson nor Alex Hill liked the type of music they were recording as the Hokum Boys. But the records sold. I didn’t like that sort of music either. But I had a system! It still works. To have a good selling record, all I had to do was have something recorded I didn’t like and wouldn’t buy if it was on the market. I’d found that the songs and artists I liked didn’t sell, and what I didn’t like sold like mad." "I had no desire to or expectation of being what was then called "recording manager" for Paramount. I was neither asked whether or not I wanted such a position, nor even informed until three months after the fact. My resentment about this has not diminished with the years! "Mayo Williams was in charge of recording. I was his secretary. Nothing was said to me to indicate that he was leaving Paramount to connect with Vocalion-Brunswick. I would have preferred to go with him and remain his secretary. He later explained that since he was aware the company intended to place me in charge of recording; he thought I’d want to position. Which all goes to show the "gap" between males and females. He was ambitious. Ergo, to his way of thinking, I was too. Well, I was not!" "Except that I could read music, play piano, arrange music, I was wholly unqualified for such a job. In the first place, my training had been on the snobbish side. I assumed that anyone whose background and environment had been different from mine was uninteresting. I’d had the old clich`E9 that a girl’s name should appear in the paper three times; once when she was born, once when she married and when she died, to such an extent that any time learned a newspaper reporter was trying to see me for an interview, I literally ran in the other direction. That explains why there is very little known about my tenure as recording manager for Paramount." "As a secretary, it wasn’t necessary for me to either talk to the artists who were constantly coming into the office, or even listen to them when they were talking among themselves. To say I thought them "odd" is the understatement of the ages. (It’s possible they held the same opinion of me). I neither liked nor disliked these people. I was merely indifferent to them. Now I recall a statement made to me by W.C. Handy, composer of the Saint Louis Blues. On one occasion when I gave forth with my undiluted opinion of what I termed "alleged artists," Handy laughed and said: "You should learn something about them. THEY have something TOO." Time has proved him correct. Eventually, I learned how utterly stupid it was to judge everyone by my own standards." "Some years ago, I was asked to write articles about these people I’d met and supervised on recording dates (6) I was shocked and saddened to realize there was very little I could write about them. I had noticed nothing but what I thought of as "faults," all negative and not one thing positive. I’d been too stupid to take advantage of an opportunity to learn about them and their experiences." "Although my conversations with the various artists were only those I was forced to have with them, I did talk with Blind Blake a lot. I was much impressed by both his sense of humor and his self-reliance. Memphis Minnie I found to be utterly different than she appeared to be, a very interesting person (note: this refers to a later period in her career - AvdT). Elzadie Robinson was a very nice, intelligent person." "At no time did I consider myself to be a recording artist. Any person, group or band, to be successful, they must have something about their work that that easily identifies them on a recording. It has always been impossible for me to play any two songs in a style that would identify me. As an example, Lester Melrose visited us one day in the late 1930s. He put on a record. I listened only to the pianist (naturally!) and stated, "That’s a very good pianist.—who is it?" Melrose replied, "YOU". Even I couldn’t identify my own playing." "Although we seemed to be the last ones to know it, we were in a Depression. We heard people talking about it, but whatever it meant, it had nothing to do with us. Paramount’s main office wrote me they were forced to retrench and offered me, in lieu of a regular salary, $20 a day whenever I brought down talent to their Grafton, Wisconsin studio. I indignantly turned down this offer and quit! Within a few months I realized how stupid I’d been." "We went to live in Indiana and when we returned to Chicago, found Lester Melrose was using the name Hokum Boys for various groups. This was OK, as after Alex Hill had left for New York and other pianists hadn’t worked out well with his own group, my husband gave up the idea of recording for that reason and one other: records weren’t selling. He made several sessions, however, after we returned to Chicago, through Melrose, who’d become a talent scout for three different labels. He might have been on (piano) some of those Hokum Boys sessions, I can’t say, as I didn’t attend any of those particular ones. I do know, however, that he sang on these sessions." "My short "recording career" [with Melrose] started accidentally. I’d known Lester Melrose for years. He knew about my stenographic ability; knew I could arrange music and write songs, even songs I detested, but he’d never heard me play piano. One day, I attended a rehearsal with him to give some songs to one of his artists. The pianist couldn’t read music so I sat down and played the songs in an effort to teach them to him. Melrose said: "This is impossible that you can also play piano well!" The upshot of the whole thing was that he asked me to make some recordings and, well, there was a Depression. I do not recall anyone named "Barrelhouse Annie." I do remember accompanying Memphis Minnie, Bumble Bee Slim, Big Bill Broonzy, Sam Theard, Lil Johnson and some others I do not recall. I accompanied Mary Mack on one session, also Sweet Peas Spivey at Aurora, Illinois and Ramona Hicks in Chicago." "This recording career came to an abrupt end. Mayo Williams and Melrose were in competition for the local talent. Mayo asked me to work again as his secretary in an office he was managing for Decca. I happily agreed. Melrose, while remaining a friend, never asked me to record for him again because I was working in Williams’ office. I was delighted." NOTE: By 1938, Aletha Dickerson was working at the Indiana Theatre at 43rd Street in Chicago, while living at 409 Oakwood Boulevard. (9) Confusingly, the Chicago Telephone Directories, from 1930 to 1954, list the Robinsons living at 10243 S. Oakley Avenue. (10) According to Thomas A. Dorsey, the Robinsons had lived in New York since 1955, but the 1957, Chicago Telephone Directories list separate addresses for Alex and Aletha Dickerson. An article by Aletha Dickerson-Robinson, originally published in Songwriters Review of February 1950, can be found on the Web at www.songpoemmusic.com/hack.htm It gives a fascinating glimpse of her post-Paramount career, in the depths of the Great Depression, working with her husband for a pair of hack songwriters in the ‘Song Poem’ business. This was the bottom-most rung of the music publishing business ladder – preying on gullible members of the public who parted with their money to have their ‘poems’ or lyrics set to music. Newspaper adverts for such businesses proclaimed that the recording industry was crying out for new talented songwriters; all it needed was your song set to music – for a fee. During her time with Paramount, Aletha appears to have copyrighted several songs; those before 1928 under her own name. After she assumed the role of recording manager in late 1928 she started to copyright songs under the nom de plume Selma Davis. One A. La Moore is thought to have been a pseudonym for Alex Robinson, also getting in on the same act! About the 1937 Barrel House Annie session, Konrad Nowakowski writes: It is clearly Aletha on piano but I see no evidence she would be the singer. Both sides of the issued coupling have composer credits; one is Mary Mack, the other Aletha Dickerson. To me, these are just part of Aletha’s accompaniment of that period. Max E. Vreede: Paramount 12000/13000 series (1971), Storyville Publications. 1 VJM’s Jazz & Blues Mart, Issue 140, p. 3. 7 Mother Machree was sung by Anthony Olinger and issued on Pm L503, a one-sided record, the matrix number being the issue number. The recording took place in Grafton, Wisconsin circa September 1930. Appendix: Aletha Dickerson Copyrights registered at the Library of Congress. Note: CL = Claimant. E = refers to the class that the work was registered in under the 1909 law. Class E was for musical works in which the author was a U. S. citizen or domiciliary or for a work first published in the U. S.
Thanks to: Rolf von Arx, Mark Berresford, Chicago Public Library Reference Team, Bob Eagle, Karl Gert zur Heide, Indiana Historical Society for supplying copies of Gennett master file cards, Konrad Nowakowski for his copy of Dickerson’s application for her Social Security Card and suggestions, Guido van Rijn for proof reading and suggestions, David Sager for the Library of Congress copyrights information, Paul Swinton, Elli Vreede and Ralph van Vurth. All photographs unless noted otherwise from Alex van der Tuuk Collection.